We had heard lots about Tonka’s (you would, seen as they have been around a really long time and are celebrating their 70th anniversary this year), but this was our first time playing with Tonka Tinys. For those of you new to the world of Tonka, they are a range of vehicular toys that are now available in miniature as Tonka Tinys. They are available either as three packs or individually as interlocking surprise blind box garages, each housing one of 20 miniature vehicles. Also new to the range are a pair of Tonka Tinys playsets available to buy now from Amazon. We have been testing the Car Crush Escape mini playset along with a pair of Tonka Tinys blind box garages, and here is what we think. The Car Crush Escape playset has movable parts and levers that have fired my son’s imagination. He once saw a scrapyard when we were travelling on the train and has been full of questions about scrapping cars ever since. Now he gets to operate his own mini scrapyard. The only twist being the chance of an escape before being crushed! 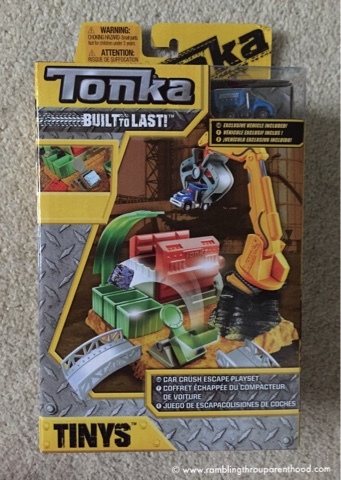 The Tonka playset has a crane with jaws that can be squeezed open and shut. The crane swivels over a base and can move a car to the crusher. The crusher itself is operated by a red lever, not unlike the real thing. An escape hatch on the side opens to allow the car to escape out before being crushed. There are a couple of add-ons like the bridges along the sides and the mini catapult that can be used to launch pieces into a green receptacle. The blind box garages are an absolute joy. You don’t know what vehicle is housed inside, so there is that element of surprise. Each tiny vehicle is small enough to sit in a toddler’s palm, so easy enough to take with you when out and about. Although tiny, there is enough attention to detail on each miniature to make them realistic. Like our fire engine that has a rotating water cannon. I will be honest. I wasn’t sure what to expect from Tonka Tinys when they first arrived in the post. Now, having played with them, I am thrilled with the quality, the attention to detail and the value for money they offer, and can’t help but be excited about a larger playset that is due to launch in autumn. Exciting times ahead! Disclosure: This post contains affiliate links to make shopping easy for you. It doesn't cost you anything extra to shop through my links. It just means I will earn a few pennies towards the upkeep of this website. We were sent a playset and a pair of mini garages for this review.